Don Fernando "Chico" Lara Padilla, 81, of Honolulu, Hawaii, passed away on February 16, 2017. 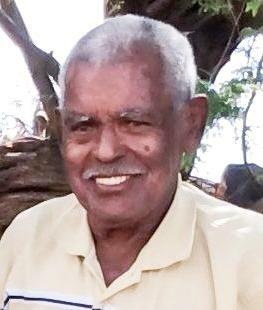 He was born on October 7, 1935 in Puerta de Tierra, San Juan, Puerto Rico. He was also actively involved as a member of the United Puerto Rican Association of Hawaii and was a dedicated member of the Fraternal Order of Eagles. He is survived by his loving wife, Margaret "Rita" Padilla (Rosario) along with five children; Ralph and Valerie Clay, Mathew and Debra Padilla, William and Joanne Clay, Antoinette and Mike Galarza and Alberto Morales Jr; 23 grandchildren, 29 great-grandchildren, his sister, Eva Lara in Puerto Rico. Memorial Services will be held at Mililani Downtown Mortuary: 20 S Kukui Street, Honolulu, Hawaii on, Tuesday, March 14, 2017. Visitation 9:00 am; Services at 10:00 am. Burial will follow at the Hawaii State Veteran Cemetery: 45-349 Kamehameha Hwy. in Kaneohe. Flowers welcome.